DC Comics bills their "DC You" Bizarro miniseries, newly collected, as the next book for Harley Quinn fans, which it is not quite right. Harley's currency, to be sure, is the character's ribald antics, whereas the Bizarro title -- the second part of DC's description being true -- is decidedly all-ages. But if Heath Corson's Bizarro starts out a little too juvenile for the Harley crowd, it catches its rhythm toward the middle with some clever ideas and strong use of the characters. 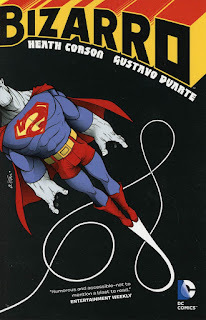 Bizarro's breakout star, however, is Brazilian artist Gustavo Duarte, who draws a charmingly caricatured Jimmy Olsen, and whom I'd love to see on an another irreverent "DC You" title of the likes of Batgirl, Black Canary, or some sitcom-y take on the Teen Titans. The first three issues of Bizarro struggle with some of the same problems that the early issues of Harley did. Corson is plenty funny throughout in the interactions between Bizarro and Jimmy Olsen (pretending to be Bizarro's friend while secretly planning a coffee table book), and between Jimmy and Clark Kent, and as the story's road trip gets underway. But the first stop is Smallville (though not used in any way as to make that location relevant), where Bizarro and Jimmy (Bizzarmy?) run afoul of a diminutive used car salesman possessed by Egyptian gods. "King Tut" and his daughter are surely not frightening threats, but neither are they terribly funny, just middle of the road goofiness of the kind that doesn't move the reader (Harley's early Sy Borgman stories were the same way); neither does Jimmy and Bizarro in an old West ghost town have much to distinguish it. Silly for silly's sake isn't enough, and that's where the beginning of the book is. Things take a turn in the fourth issue, however, when Bizarro and Jimmy meet Zatanna. An earlier issue cameos the ghost of Jonah Hex, but here's where Corson really begins playing with the DC Universe proper, as well as truly innovating in what it means to be Bizarro -- no one else has ever suggested Bizarro could do backward magic, and it leads to a one-page whirlwind tour of DC's magic realms. And that's before the book's best bit, which sells everything that comes before and after, in which Bizarro turns Jimmy into "Jimzarro" and becomes normal himself, a sequence wholly hilarious, tragic, and touching all in one. The final two issues include Mulder and Scully look-alikes, Kilowog's bad-natured cousin, Lois Lane, a great Bizarro/Superman heart-to-heart, and the unlikely "Bizarro League." The buddy comedy fight-and-then-get-along trope is in full and predictable effect here, but somewhere along that Superman scene, I did actually care about Bizarro and Jimmy even as the story's trajectory is telegraphed from the beginning. Corson continues to establish perfectly (imperfectly?) logical facets of Bizarro that no one's thought of before, including that Bizarro's a whiz at blackjack (by hitting when he shouldn't) and does terribly (read: astoundingly accurate) voice impressions of the people around him. Again, Gustavo Duarte's big-eared, round-nosed, high-foreheaded Jimmy Olsen makes for a wonderfully weird leading man; the caricature of Jimmy comes from nowhere and yet seems precisely Jimmy-esque (Duarte is welcome to a Lois Lane, Zatanna, or Jonah Hex book, too). Every issue has a guest art cameo or two, too; I especially liked Francis Manapul illustrating when Bizarro's arm catches the Flash in the face and Tim Sale's For All Seasons-inspired Superman. Heath Corson's Bizarro is entirely out of continuity, of course, beginning not in the least with Bizarro's not-a-clone-of-Superman origins. Harley Quinn is in continuity, and I imagine one impediment to Bizarro being more than a miniseries is that the eventual knots some editor would tie themselves in, all protestations to the contrary, in that the Bizarro title couldn't just be dragged into this or that crossover or themed event. Still Bizarro is ultimately a fun read in the final total; as an ongoing, I don't think I'd come back month to month, but I wouldn't hesitate to go back on the road with the Bizarro and Jimmy odd couple for another mini. I'll have to read the issue but Corson's Bizarro seems pretty well out of continuity to me. I guess I'd be surprised that Greg Pak referenced Corson's book without Corson or Duarte involved; also I think Corson's Bizarro wasn't actually Bizarro-Superman on his own world. Anyway, I'd be happy if it was canon -- timeline! -- and agreed it was a great book. Wow, you sold me in at least checking this out. It was Bizarro playing blackjack, wasn't it? I do hope the creative team do more like this in the future. The amount of charm is everywhere in this book; even the spine is purposefully backwards and upside down. Give the book designer kuddos there!